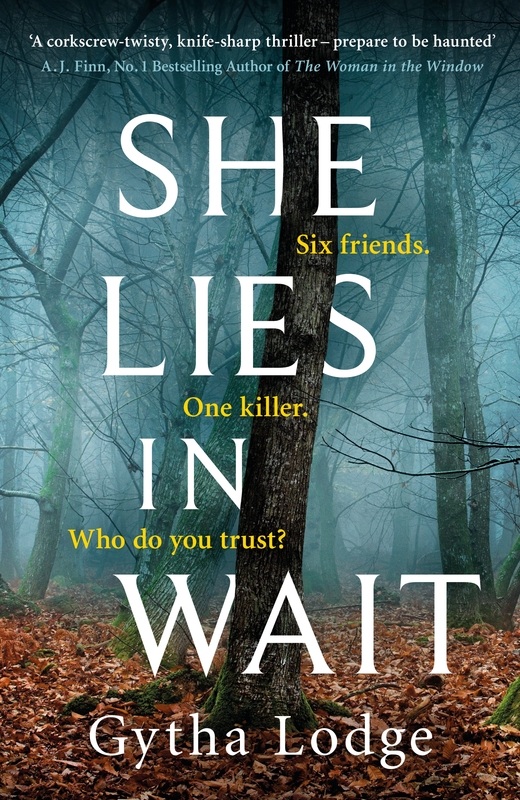 Today on the book tour for Gytha Lodge’s new book called ‘She Lies In Wait’, sit back and enjoy an extract from the chilling tale. She heard her name, and felt an answering buzz of adrenalin. She paused, then kicked her way on again. Just her brother, not Dad. Away up the slope. Her brother wasn’t going to yell at her for wandering off. It was quiet. Much quieter than up by the camping stove where Dad’s commands were unrelenting. Her ears were full of leaves rustling, and rushes of birdsong. She left the shadow of the trees, the sun making fierce patterns on skin already hot from scrambling. She put a hand up over her eyes to block the glare from the water. She should have brought sunglasses, and thought about going back for them. But she didn’t want to risk being seen. Not when being seen meant being inspected for dirt and told to clean herself, lay the table, and put things away. She moved into the shadows under the bank, her eyes dazzled. There were blue patterns everywhere she looked. A spreading beech tree was above her, and roots arced out of the soil like flattened croquet hoops. Her foot caught on one. She stumbled, her heart jolting as she thought she might fall into the water. The river was dirty in the shadows under the tree, ominous. But she wasn’t really close enough to fall in, and she regained her balance. In front of her was a scooped-out section of earth the shape of a hammock that made her want to nestle in it. Great. It was her dad this time, and closer by. He was using the kind of voice that wanted an answer. But in front of her was the cool earth, and a hiding place. She stretched one foot down into the hollow, and then the other. She felt immediately cooler, and took a seat on the slightly crumbly earth. She imagined herself as an early vil- lager, sheltering in the woods while Vikings raided her home. But it wasn’t as soft as she’d expected. Ridges of root pressed against her pelvis and back. She squirmed left and right, trying to find a comfortable spot. Her shorts snagged, and she felt a jab in her leg. She pushed a hand down to disentangle the cloth, and then felt the root crumble in her hand. She lifted it and saw not old wood, but flakes of brown, and the bleach-white shapes of freshly exposed bone. She didn’t need her GP father to tell her she was holding a human finger. Jonah was halfway up Blissford Hill when he felt the buzz of his phone in the zip pocket on the back of his Lycra. He was standing up on the pedals and slogging upwards. He considered ignoring it, and then had a vivid image of his mum in hospital. And following that, he had a slightly stomach-turning thought that it might be Michelle. Which was just as irrational as every other time he’d believed it in the last eight months, but he thought it anyway. He braked with gritted teeth and stopped his grinding climb. He caught his shin on one of the pedals as he jumped down, and was savage by the time he’d rooted his phone out and seen DS Lightman’s extension flashing on the screen. ‘Ben?’ he said, and then moved the phone away from his mouth to mask his heavy breathing. Jonah let the DS wait in silence. He looked up at the tree- shadowed top of the hill. It was a slog away, but he wanted the slog. His legs were crying out for it. He squeezed the drop handles of his bike with his free hand and felt the sweat on his palm. He hadn’t spent enough time doing this recently. ‘Where?’ he asked, not bothering to hide his irritation. There was another silence, but this one wasn’t deliberate. He felt knocked off balance. ‘Recent remains?’ he asked in the end, though he thought he knew the answer. ‘No. DCS says not,’ said the sergeant, who was too young to understand. His day of cycling was over, but Jonah suddenly felt too old for it anyway. He couldn’t remember ever feeling old before. ‘Yes, sir,’ Lightman answered, his voice as level as ever. Jonah slotted his phone back into the pocket of the tech- nical top. There was sweat already cooling on him and leaving him chilled. He ought to get cycling again. It was a few more miles to Godshill. He stayed there, unmoving, for a full minute, then swung his leg off the Cannondale and started to walk it slowly up the hill. Hanson was in such a hurry to climb out of the car that she caught the sleeve of her expensive new suit on a protruding piece in the door and pulled a thread. It gave her a slightly sick feeling. She hadn’t really been able to afford it in the first place. She’d bought three others in her first two weeks as a DC, having previously owned only jeans, tank tops and sweaters, and a few dresses for going out. Suits were bloody expensive, and she resented the money she could have been spending on her unreliable car. Or maybe on an actual social life, which she seemed to have forgotten about somewhere along the way. She tried to smooth the plucked sleeve down while she made her way inside. She wondered if she could get her mum to take a look at it, if she managed to make it to her mum’s any time soon. A potential homicide might mean working through the weekend. Late nights and living off caffeine while they caught the killer. The thought made her smile. She let herself into CID and saw Lightman’s head bent over his screen. 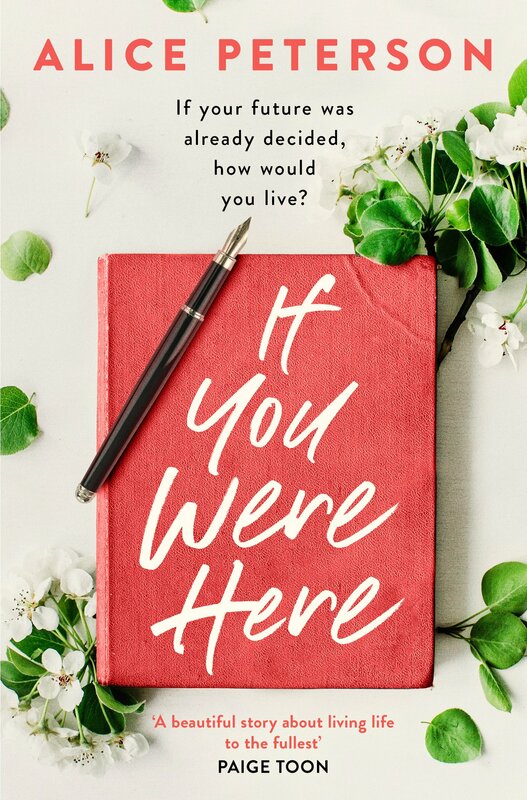 She wondered how long he’d been here, and whether he did anything else with his life. Whether there was a Lightman wife and kids that he hadn’t yet mentioned. He somehow had the look of an unfaithful husband about him. Too pretty, and too closed off. Unless that was more her own recent experience warping her expectations. Hanson nodded. She pretended she knew the place well,and that she wasn’t about to punch it into her satnav. Two weeks into the job and she basically knew the route from home to the station and the supermarket, and from there to the dockside, where they’d been looking at some potential fraud. She missed the certainty of zooming around Birmingham, where she’d grown up, and then worked as a constable for two years. Though she had to admit that the New Forest was a lot prettier. Hanson nodded, and tried not to smile. You shouldn’t smile at news of a murder, even if it had been ages ago. But the truth was, she was delighted. Hanson was wound up like it was exam results day. She gabbled at Jonah about the kitbag and coffee, and then without pausing for breath asked about the remains. Jonah found it somewhere between sweet and irritating. ‘Ben said they might not be recent,’ she said. Having sweated and chilled, he was cold even in the suit he had tugged on in the public toilets at Godshill. Cold, and drifting around his own thoughts of thirty years ago. He had to interrupt her to ask her to turn the heater on. The Fiat veered while she turned the dial, and then steadied. Brinken Wood was suddenly on them. There was a cluster of squad cars and uniforms in the shingle car park. He found it impossible not to remember this place as it had been back then. The car park had all been bark and mud, but it had been just as overrun by police. The haircuts different; the faces somehow the same. Jonah levered himself out of the car once they’d pulled up, taking the coffee cup with him. He felt like he’d gone back in time. So many months had been spent here, searching endlessly. Hanson had been the same rank as the sergeant two weeks ago. But to train as a detective, you had to take what amounted to a demotion, and become a detective constable. Jonah remembered not being sure who was more important when it had happened to him, and wondered if Hanson felt the same. There was sweat along the sergeant’s hairline. His eyes were over-wide and his smile brief and agitated. His police constable, a stocky twenty-something, seemed calmer. Jonah nodded, and let the sergeant lead the way, though he knew where he was going. It was where seven kids had bedded down thirty years ago, but only six of them had got up in the morning. Dr Martin Miller was sitting apart from his family. The doc- tor’s wife was watching the boy play on an iPad. The girl was kicking up dust around the edge of the camp. It was the mother Jonah approached. The girl was halfway upset and halfway rebellious. She scuffed over to her mother and Jonah, sat down quickly, and looked up at him, her knees up near her chin. The mother slid an arm round her in a brief hug. ‘You don’t mind talking to the police, do you, Jessie?’ she asked her daughter. ‘She doesn’t know anything,’ her slightly older brother interrupted scathingly. The disdain of older siblings had always seemed uniquely intense to Jonah. He glanced over at the boy, who was now watching them both a little sullenly. He thought about asking him to move away, but decided to let him be. The girl gave him another wary look, and then her gaze wandered away and she picked up a pebble, threw it off to the side, repeated it with another. ‘Jessie, for goodness’ sake!’ The father again. Much closer. Jonah might as well not have spoken. The girl gave her father a truculent look, and then did her best to look up at Jonah through her straight brown fringe. Jonah tried not to become irritated at the father’s interruptions, which had nothing to do with helping the police, he thought, and everything to do with control. ‘Are you an inspector?’ Jessie asked quietly. ‘Yes.’ She seemed happy enough with that, so he went on. Jessie glanced at her father, and then said quietly, ‘Hiding.’ Jonah saw the mother grimace, but she didn’t try to deny it. ‘Hiding can be fun,’ he said. ‘That hollow under the tree. Jessie nodded, gave a small smile, and stood up. Her mother pulled her into a brief hug. ‘I’d like them not to talk to their school friends about this for a few days,’ Jonah said to Mrs Miller, once she’d let go of her daughter. Privately educated kids, he realized. They were already on holiday, a good month before the state schools broke up. He heard Dr Miller’s footsteps. As Jonah stood, the doctor was already giving his children orders to get packed up. He hurried them over to the tent, and Jonah found himself watching until Mrs Miller rose and began to pick up a few half-eaten packs of raisins and a cup. ‘I’m sorry your holiday got interrupted,’ he said. Jonah nodded, wondering whether she was used to apolo- gizing for her husband. But he understood that she meant cancer; that those bones had been a little handful of mortality. He felt a trace of sympathy. An hour and a half of excavation. Dozens of photographs. A tent set up and eight bags of carefully labelled bone fragments. Everyone was getting hot and irritable. Jonah’s mouth was beginning to taste like bitter, hours-old coffee. His feet were fractious, impossible to keep still. And he had the kind of energy-sapping hunger that made it hard to focus. ‘Anything yet?’ Hanson asked, after wandering up to the car park and back a few times. Excitement had turned into boredom, the one reliable constant in the emotional range of every detective. ‘We can be here when they want to talk to us,’ he said with a half-smile. Some twenty minutes later, Linda McCullough, the scene of crime officer, stepped carefully up out of the dip and approached him. He was glad it was McCullough. You needed someone obsessively careful on a site that would have only the barest traces of data left. Thirty years, he thought. Thirty. He found it hard, momentarily, to believe that so much time had passed. A feeling that he must be Rip van Winkle, and have slept through much of his life, ran through him. Rip van Winkle must have felt this strange mixture of anger and guilt, too. She replaced her mask and climbed carefully back to the site, disappearing into the tent. You can buy ‘She Lies In Wait’ from Amazon and is available to buy from good bookshops. 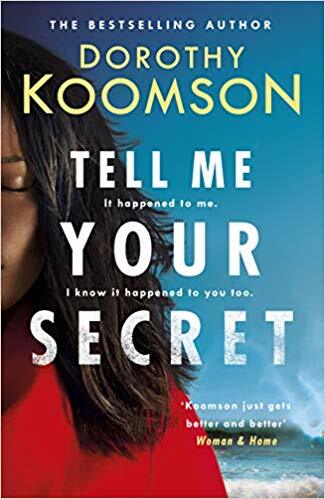 Queen of the Big Reveal, Dorothy Koomson is back with a new book called ‘Tell Me Your Secret’. Ten years ago, Pieta was kidnapped by a man calling himself The Blindfolder who said he wouldn’t kill her if she kept her eyes closed for 48 hours. She never told anyone what happened to her, vowing to move on with her life. But when The Blindfolder starts hunting down his past victims, Pieta realises she may finally be forced to tell her deepest secret to stay alive . . .
Fifteen years ago, policewoman Jody made a terrible mistake that resulted in a serial killer known as The Blindfolder escaping justice. When Jody discovers journalist Pieta survived an attack by him, she realises she may finally have found a way to catch him. But that would mean endangering at least two innocent people . . . They kept quiet to protect themselves. Will telling all save or sacrifice each other? Sounds like another great book to look forward to in 2019. You can buy ‘Tell Me A Secret’ from Amazon and will be available to buy from good bookshops from 27th June 2019. 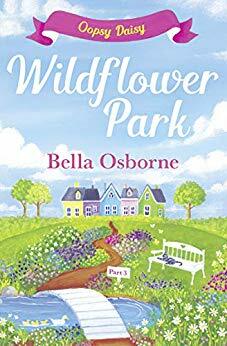 On the back tour for Part 3 of Bella Osborne’s ‘Wildflower Park’ series, called ‘Oopsy Daisy’, enjoy an extract from the fun tale. Sophie had been having the same conversation for what felt like slightly longer than forever when Anna pulled up. Hopefully she’d be able to make sense of whatever Mrs Nowakowski was going on about. ‘What’s the matter?’ asked Anna, butting in. They both started to speak at once and Anna held up her hands to stop them. ‘You make this nice place look like burdel. That is problem.’ She crossed her arms and gave a sharp nod of her head. ‘I think she means brothel.’ Sophie dissolved into giggles and felt the baby kick in response. ‘Why? What have we done?’ asked Anna. ‘The bra hanging in your window.’ Mrs Nowakowski pointed round to the side of the building where Anna’s lounge window was. Anna walked round and as the laughter died Sophie followed. When they reached the window the three women stopped and stared at the large bright red bra hanging there. Anna unfolded her arms and pointed to her chest. ‘Well, it’s definitely not mine!’ Anna was grinning. ‘Is it the international symbol for brothel?’ asked Anna. ‘According to Mrs Nosy-kowski,’ whispered Sophie. 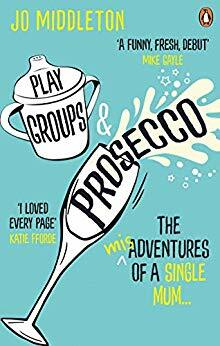 As the two friends descended into yet more giggles Mrs Nowakowski shook her head and went home. Eventually they realised they were alone and went inside. Anna tugged down the bra that was hooked over the handle of the window, shook her head and dropped the bra in the dirty clothes bin.